How many times have you been out and about with the only Internet contact available being your mobile or tablet? Moreover, how many times have you punched in a favorite website, or one from which you need to get some important business information, and found it either doesn’t fit the screen or the images and text are so small they’re all but impossible to see? Of course, you can zoom in, but then you’re having to scroll from side to side or up and down to try and make sense of the information. Chances are you’ll give up. If you were looking to buy something from a website, then that’s a lost sale for the business. So what should businesses be doing to attract you and keep you? In addition, what should you be doing to ensure that people who come to your website, using a variety of devices, will stick with you? The day of the desktop computer came, as did the day of the laptop. They are still essential parts of most businesses day-to-day operations but you could almost compare them to the difference between steam and electric trains. They still work and they have a function, but the rise of mobile browsing means that web designs suitable for desktops and laptops must be redeveloped. Responsive web design is a technique that means a system or site will react to the size of the screen being viewed by the user. The technique creates a responsive and flexible web page that is optimized for whatever device is accessing it, giving the user easy accessibility to the content. The traditional method of web design meant that users would be re-directed to a site specific for the device being used to access it. If you were using a smartphone, you would be directed to the site where your user experience would be better, but that’s an expensive and time-consuming process for businesses to adopt. 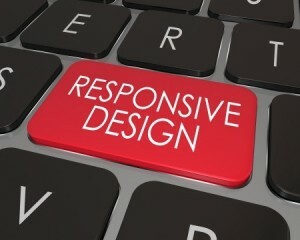 Responsive web design allows businesses to implement one site across all devices. By developing a unified design approach that takes into account different screen sizes, businesses can achieve a consistency in how they present themselves and their products and services. Consumers like to feel comfortable with what they have come to expect, and if things look markedly different on a small screen, or text and images are small or don’t load well, they’re more than likely to give up. If you use responsive design, your conversion rate is likely to be positive, as people are familiar with navigation that is the same on all devices. Your analytics can be consolidated instead of having to track them between multiple sites. These are key reasons a mobile optimized website is a must. The huge increase in mobile browsing and accessing news, weather, and other information, makes responsive web design an essential tool for any business looking to attract customers and maximize its market share. Make sure you’re up there.